Finding yourself or your business involved in a corporate criminal investigation can be an incredibly distressing time, causing disruption to your work and personal life. It is important you feel at ease during this time and have a full understanding of what is ahead of you, placing you in the best position to defend yourself. Our team of business crime solicitors are here to assist you with any corporate crime or fraud issues your business may have, offering our services and expertise to help you build a strong case. To speak to a member of the team, contact our Manchester office today by calling 0161 827 9500, or fill in our contact form and we will call you back. We are able to provide advice and guidance throughout each stage of the criminal or regulatory proceedings, and our service is tailor-made so you have the support you need as and when you need it. With over 35 years of experience, our defence lawyers are well placed to handle your corporate crime or fraud case. We understand what is necessary to build a proactive case and provide first-class representation to fight your prosecution and help you get the best possible outcome. We will provide round-the-clock assistance so you are kept up to date on matters and can get in touch with us 24 hours a day, seven days a week should you have any questions or queries. If you or your company is facing an investigation for criminal or fraudulent activity, you need to make sure that you have the right team fighting on your side. 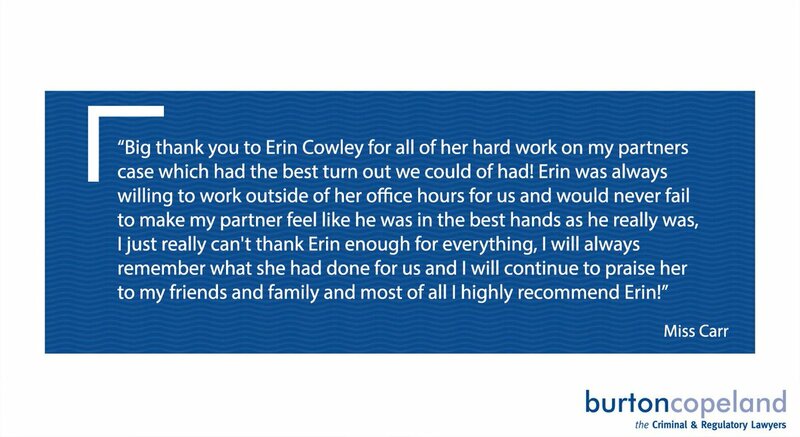 Get in touch with Burton Copeland today by calling 0161 827 9500 to speak to one of our dedicated and experienced solicitors. If you’re calling out of office hours, use 0161 832 7834 to speak to us, or complete our online form and we will get back to you as soon as possible.